The prime coat is a coating of a binder onto a compacted granular base prior to application of subsequent courses. Prime coats are generally applied to improve pavement’s binding to the untreated aggregate base, and helps the performance of the base if it is going to remain exposed to the weather for at least seven days or if it is going to carry traffic before HMA paving. The main purpose of providing a prime coat is to prevent water from penetrating into the base, thus waterproofing the base and improve the strength of the base. A prime coat application is said to be cured once most of its carrier has evaporated. So, as expected, the time taken for curing will change considerably with the weather conditions. The time taken for curing will also depend on the type of prime coat, application method, application rate, rate of dilution of the prime coat, properties of the base and many more factors. The Texas Pavement Preservation Center is currently doing a study that aims to capture the effect of weather conditions, application method and type of prime coast on the curing time. To determine the time taken and verify the performance of prime coats, around 50 soil specimens were prepared and tested in three different seasons (summer, fall and winter) to capture the effects of weather. Prime coats which were included in this study were MC-30, AEP, EC-30, CSS-1H, SS-1H, and Top Seal Black. 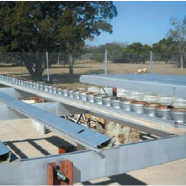 Limestone base soil which is most commonly found in the Texas region was used as base material throughout the testing program. Two different application methods were used namely, spray prime specimens and mixed-in prime specimens. For spray prime specimens, 16 oz circular cans of 4-in. diameter and 2.4-in. height were used. Soil was placed in three layers and each layer was compacted by giving 25 blows each using a wooden hammer. Once the sample was well compacted and ready, prime coat material was sprayed on top of the specimen in such a way that it covers the whole surface evenly. In case of mixed-in prime specimens the same method was followed except that instead of spraying, the prime coat was mixed with the top layer of soil and then compacted. After the samples were prepared, they were exposed to weather and were weighed each day to determine the decrease in weight with time. When all the solvent is almost evaporated or when the sample is cured the weight would become a constant. This was the basic principle behind determining the time taken for curing of each prime coat. The measurements taken by the weather station included air temperature, relative humidity, solar radiation, wind speed, wind direction and barometric pressure. Of these measurements that were taken the ones that will affect the curing time the most would be the air temperature, solar radiation, humidity and wind speed. The study will propose a formula based on the effect of each of the above mentioned weather components on the curing time of prime coats. A comparison will also be made between the strength and the permeability characteristics of different prime coats.